Of all the fads I ever guilted my Mom into letting me indulge in, the 90s resurgence of yo-yos, culminating in the purchase of a $110 Tom Kuhn Silver Bullet in a tortoise shell colorway was probably the most ridiculous. $200 tops feel like coming home. ForeverSpin makes some incredible looking and performing tops, with a particular focus on materials. The lowest entry point as of this writing is the aluminum model on Amazon for $38, which is “great for upside down spins”. Some options are cheaper directly from ForeverSpin, but you’ll have to hit $69 (nice) for free shipping. While we don’t expect our collection to grow to the point where we need a five-top dock, ForeverSpin’s Spinning Base is actually pretty great both as a stage and a spinning surface, and currently discounted to $33 in the ForeverSpin Huckberry store. Huckberry also has the titanium top discounted to $40, or a bundle of the base and top for $80. 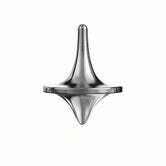 We checked out the Black Zirconium top, along with a Spinning Base, and yeah, with no prior training in top spinning, our first go round was still basically Inception.